Squire’s theorem, which states that the two-dimensional instabilities are more dangerous than the three-dimensional instabilities, is revisited here for a flow down an incline, making use of numerical stability analysis and Squire relationships when available. For flows down inclined planes, one of these Squire relationships involves the slopes of the inclines. This means that the Reynolds number associated with a two-dimensional wave can be shown to be smaller than that for an oblique wave, but this oblique wave being obtained for a larger slope. Physically speaking, this prevents the possibility to directly compare the thresholds at a given slope. The goal of the paper is then to reach a conclusion about the predominance or not of two-dimensional instabilities at a given slope, which is of practical interest for industrial or environmental applications. For a Newtonian fluid, it is shown that, for a given slope, oblique wave instabilities are never the dominant instabilities. Both the Squire relationships and the particular variations of the two-dimensional wave critical curve with regard to the inclination angle are involved in the proof of this result. 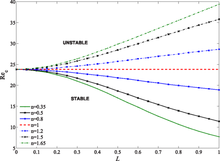 For a generalized Newtonian fluid, a similar result can only be obtained for a reduced stability problem where some term connected to the perturbation of viscosity is neglected. For the general stability problem, however, no Squire relationships can be derived and the numerical stability results show that the thresholds for oblique waves can be smaller than the thresholds for two-dimensional waves at a given slope, particularly for large obliquity angles and strong shear-thinning behaviors. The conclusion is then completely different in that case : the dominant instability for a generalized Newtonian fluid flowing down an inclined plane with a given slope can be three dimensional.